The design and color of this can told me immediately what it is all about. I barely needed to read the label, and when I did, it confirmed that first impression – Coconut Hiwa Porter by Maui Brewing Co.
As a reporter for The Maui News back in another century, I can say without hesitation that my colleagues and I from that time – beer lovers one and all – longed for a place to hang out and drink good beer. Back then, when the Sunday edition crew got off after sending the issue to press Saturday night, the only place readily accessible to satisfy our hunger and thirst for beer was Pizza Hut. The only other place open at the time of night was a waterfront bar – great place to tie one on, but no food after 9 pm, and after the three of us put out that Sunday paper, we needed drink and food. Now, 30 years later, I can buy coconut porter made in Kihei, Maui, right here in Door County, Wisconsin. Man, I might still be there if this was being made in Kihei back in 1988. Who knows? 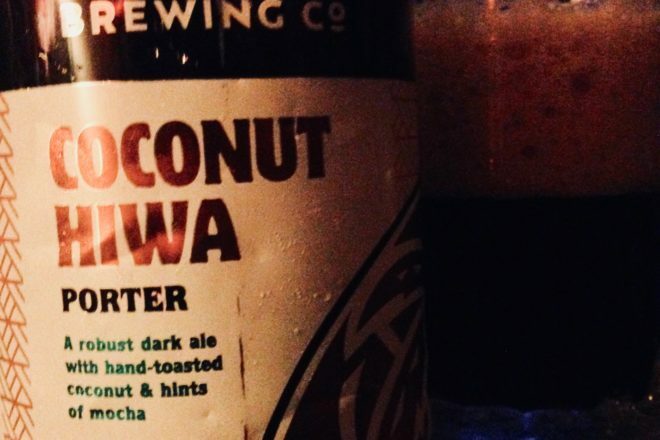 I know my old Saturday night crew – Roy Tanaka and Lee Imada, and sometimes Ron Youngblood, but he was always more of a smoker than a drinker – would have no problem making the run from the office in Kahului to Kihei after a shift for some of this rich, delicious coconutty porter. Honestly, back then the only exotic beer on tap was way over on the west side of the island – the tourist side. Wiki Wiki Pizza, a little place on the water in Lahaina, facing the pineapple island of Lanai, had indifferent pizza and Anchor Steam on tap. That was the most interesting beer thing happening on Maui during the Reagan years. And it’s been 21 years since I’ve been back to Maui. When last there in 1997, there was some craft beery activity, but nothing to write home about. I just had an image of myself drinking a great beer at the Maui Brewing Co. in Kihei after a swim at Big Beach. In January. 2019. Cheers! : Wham, Bam, Thank You, Madame!